A thank you move is a move which induces the opponent to respond where he would have liked to play anyway. 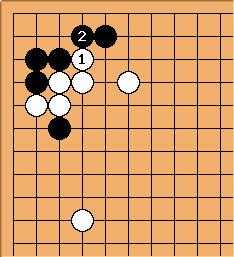 In the process, no (or little) profit has been gained while the opponent's aji is fixed. is a good example of a thank you move. 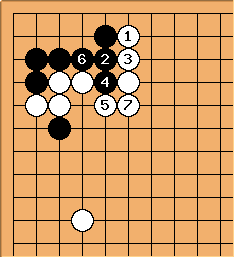 It forces White to connect her stones, pretty much in sente, fixing the biggest flaw in her shape before launching an attack on the top. 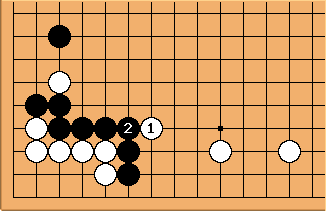 Further, White can capture at a on her next move. A better move for might be a. This is standard joseki, and the thank you move follows in the diagram after this. is yet another thank you move. It makes connect, something Black wanted to do in the first place. What White could have played, depending on the situation, is to attach at , resulting in a thick wall after . With the thank you move in the previous diagram, the possibility of attaching at here is lost. A related example is over at aji-keshi. peeps at the cutting point, which happily connects. 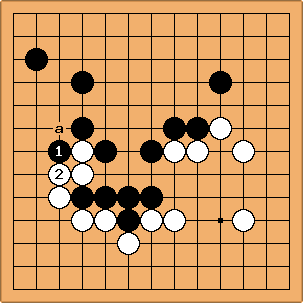 A typical thank you move, and White has not accomplished anything after Black's major aji has disappeared. White should cut at in this diagram. Now the group at the bottom does not have a base and is attacked, and that the marked stone can cause trouble later in the game. Compare the two diagrams. This one is obviously better for White. There is a big difference between a good forcing move (kikashi) and a thank you move. 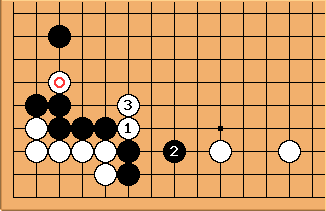 Kikashi applies to those forcing moves having a positive, effective role to play. The Japanese term for thank you move is arigatai te.